Yes, Pac-12 Networks content is available via DAZN Canada. 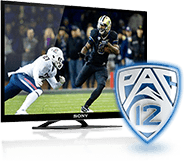 Please visit DAZN.com for options to receive Pac-12 Networks. Also, through Pac-12 Plus a number of additional live events, produced by the Conference’s 12 universities, will be streamed on Pac-12.com and the Pac-12 Now app (for iOS and Android). More information on Pac-12 Plus can be found here.